oz.Typewriter: Imperial 70 Standard Typewriter: The Long Road to Redemption - Part Two. Complete and Utter Success! Imperial 70 Standard Typewriter: The Long Road to Redemption - Part Two. Complete and Utter Success! 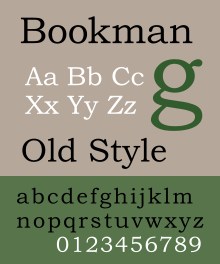 Yes, Bookman Old Style (my favourite): It is working, perfectly. 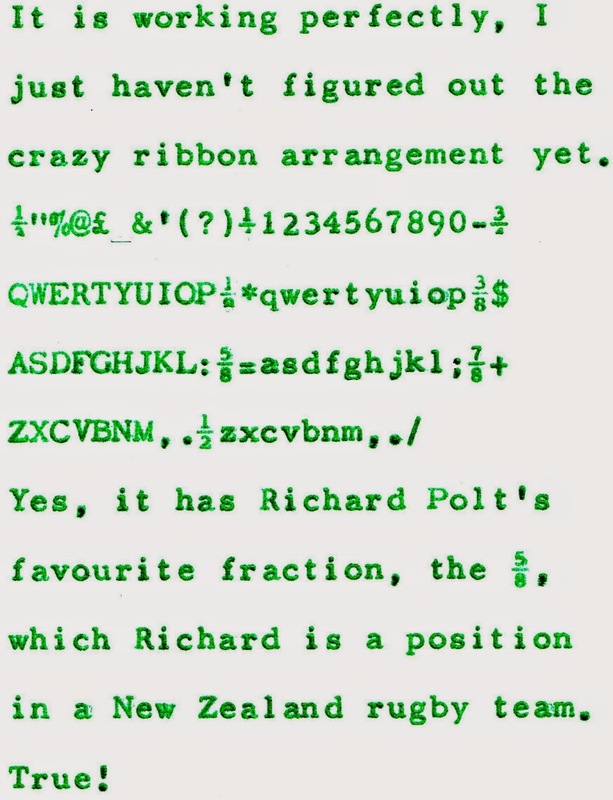 Richard Polt. New Zealand rugby. Lovely. Well, I'm not Rumpelstiltskin. I had this arduous two-day project completed just after midday today. All up, it was probably close to a seven or eight-hour undertaking. But it was well worth the effort. The Imperial 70 is working wonderfully well (I made no effort to retain the carbon ribbon facility), it looks brilliant - and I really love its "Bookman Old Style" typeface. Having hoped for fine weather today so I could resume the job, by taking the typewriter outside and giving it a decent blow-through with the air-compressor, I woke up to black skies and heavy rain. Nonetheless, I was able to find a sheltered spot, and so the work progressed unabated. As I began to reassemble the machine, starting with the large plate that sits under the carriage component, I discovered what had, initially, caused the most major concern - the carriage component sitting, jammed, at a very distinct angle. One of the large nuts which, underneath the plate, hold the studs in place, had become dislodged at some point, meaning the stud was loose. The studs (one of which is circled below) are what the carriage component clips on to. That the carriage component was wonky and yet rigidly so was hardly surprising in these circumstances. Normally, when dealing with this large plate on an Imperial, it is NOT necessary (nor advisable) to take these studs off. As explained earlier, I had decided to ditch the carbon ribbon facility, as I would have no use for it. Taking off the spindle to which the chain belt (below) attaches, to turn the carbon ribbon spools, allowed me ample access to improvise a large nut to hold the errant stud firmly in place. At one point I was even tempted to use bits of the chain belt to improvise connecting end-clips for the drawband, as one of these had gone missing. Eventually I used another method, which proved very successful. Having got the errant stud sitting properly in place, replacing the carriage component, drawband attached, was relatively straight-forward. And when this total transformation of the Imperial 70 - less than 36 hours earlier in such a terrible, horrible mess I was strongly tempted to chuck it out - was complete, it all suddenly seemed to be equally simple. It wasn't, of course, but I am thrilled with the result - a beautiful, fully functioning (forget the carbon ribbon) typewriter, sparkling like a National guitar, not to mention the Mississippi Delta, and an absolute joy to type with - especially with this Bookman-like font. I am so glad I persevered with this machine and was able to restore it to its former glory, and am so thankful for John Lavery's encouragement and assistance in doing so. Nice work Robert, you have breathed new life into the old girl. That typewriter will make some happy long into the future. The green ribbon is a nice touch. The type face is exactly the same as mine! Congratulations once again, and I am very glad that you saved such a lovely machine from the rubbish tip. Brilliant work. It's a very impressive beast and the typeface is fantastic. British comedian Eddie Izzard just did a show in Cincinnati, which my family caught, and his funniest bit, believe it or not, was about fractions. Congratulations on your fine repair. I love the great looking clean typeface. The green makes it especially nice looking. I've used foam degreaser on engines,but I never gave thought to it for a typewriter. I need to give it a go on my next project machine. Congratulations, that's a very nice looking machine! I really like the color and the crinkle effect of the paint; is it a metallic blue paint, by chance? How old is this typewriter? So, is this beauty pale blue, or grey. The befores look blue, the afters look grey. It has the feel, and solid look of my 1955 Adler Universal, - yes, what year is it from? Great work Robert - I love the older "office standards"
Thank you all for your very encouraging comments. In Ozzie lingo, I'd be described, in terms of typewriter mechanics, as knowing "five-eights of f*** all!" Richard, I have followed up on the degreaser. I believe this one does sell in the US (the company is British. Miguel and Donald, yes it is metallic pale blue, you must forgive the lack of lighting in my kitchen. The serial number is 7B60157, meaning it was made in Leicester in 1967, after the Litton takeover. The 70 was made from 1962-1968. The carriage brake must have come in very handy for service engineers. I don't think such a feature appeared on earlier Imperial standards, at least not the 55 or the 66. Once the carriage strap is removed, it is like wrestling a bag of eels to keep the two parts of the sub-assembly in check. My guess on the wonky assembly? The little silver release buttons look so tempting to push, I reckon someone pushed one, half-heartedly pulled up on the carriage and then panicked - end of chapter 1.